At the end of the day two cats sit in the window, sunset facing, while my husband walks the trash to the curb. Two fresh bodies are tucked into bed. Two still-dirty ones stretch the last minutes of daylight in the yard. There was some discussion this morning of knocking out a wall in the upstairs of our house. Common sense prevailed though (No new projects right now, thank you very much!) and the cool blue sky drew us outside. We moved a pile of wood, cleared up a patch of land under the big pine tree. 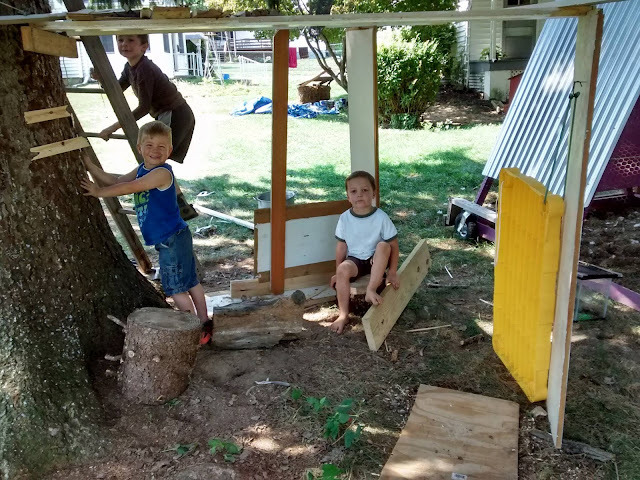 The kids built a fort, tag-teaming lumber from the garage to the very space we were clearing, under the big pine tree. The dog found a toad, who became a pet. Lucky, he was rescued from the dog. Unlucky, he will spend the night in an old fish tank. Dead flies, worms, pieces of fruit, the lid of a peanut butter jar filled with water, all of these served as offerings for the toad. Still, he seemed to be without appetite. I chopped some wood, throwing the axe out over my shoulder, missing half the time, aware of the vulnerability of my toes exposed in sandals. Every once in a while I hit home and the wood snapped with a satisfying crack – worth the effort it took. The wood pile behind the garage grew slowly, a long stretch of Lincoln Logs strung together, wobbly. I hammered nails in the kids’ fort. Hooks for the hatch-door. My daughter knelt on the ground with wire cutters snipping chicken wire which became a window. By the end of the day, the oldest boy built a zip-line which, failing to zip, turned into a log-launcher. And we all left the dinner table, measuring tape in hand, and stood staring at the old wooden stairway that runs through the heart of our house. “Could we turn it into a slide?” someone asked. My husband turned to me, a light shining in his eyes. "It’s 14 feet," he said. "You can buy a 2x12x16 ft. board for about $30." “Will we? Will we?” the kids clamored. "Maybe," we said, "it'll be a winter project." Kelly, SO great to see a photo of your kids. No 'celebrating' here other than enjoying the last few flowers and veggies in the garden, reading and writing on the deck and enjoying the feel of Fall in the air. Sweetness of children at play, summer's endings and tired parents holding it all together, held by God. Happiness!